Portable and foldable Eurorack case with three rows à 84HP width and a depth of up to 85mm in the middle row, 50 mm in the upper and lower row. 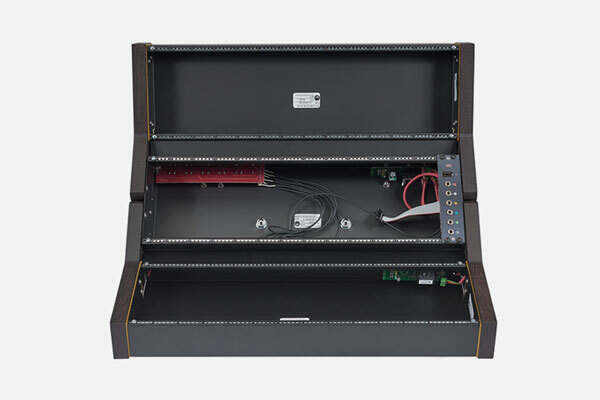 In this simple metal case with wenge wood sides all screws and folding mechanisims are hidden, the case is "ready to go" as it is equipped with a SILTA power distribution (3.75A @ +12V, 3.75A @ -12V, 1.5A @ +5V), an external power supply (24V DC, 90W) and the SEI module. Apart from that you get a soft bag with inner padding made with a 5 mm closed cells polyurethane foam. The case and the modules are safe from rain since the bag has a double zip. The soft bag has two handles and a shoulder belt, furthermore there is a pocket on the outside for the power supply and some patch cables.